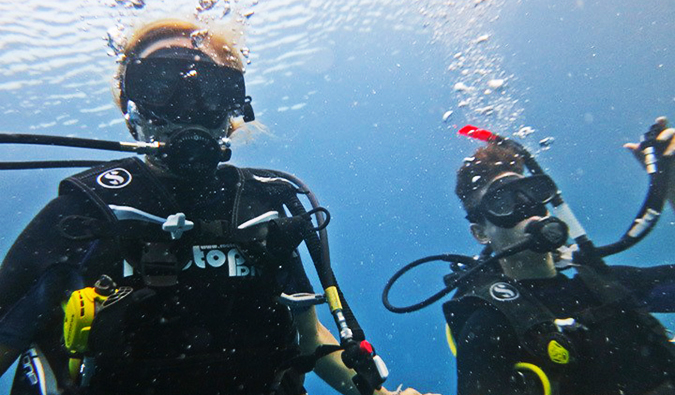 This is a guest post by Alexandra Baackes about her diving experience in Koh Tao, Thailand. 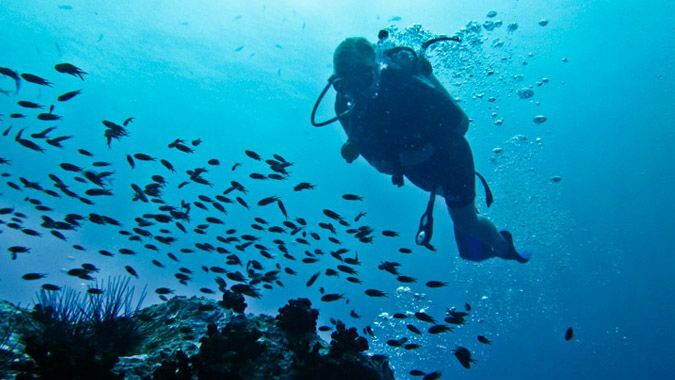 Koh Tao is a popular destination for scuba divers, and so in this guide Alexandra gives you the insider scoop for diving schools, prices, and the best areas for seeing sea life. Travelers in Thailand like to label their destinations neatly. Intricate island paradises are boiled down to one or two simple words or associations. Koh Phi Phi? The Beach. Koh Phangan? The Full Moon Party. Koh Tao? Diving. Some of them are fairly well deserved. After all, Koh Tao (“Turtle Island”) is second only to Cairns, Australia, when it comes to number of annual dive certifications. Travelers flock from all over Southeast Asia to take their first breaths underwater in the coral reefs fringing Turtle Island. And it’s easy to see why: the courses are cheap, the dive sites are abundant, the island is beautiful, and the lifestyle is easy. Prospective divers heading to the island are spoiled for choice when it comes to dive schools, dive instructors, and dive sites. But competition for business is fierce (there are over 50 dive shops on this small island! ), so it definitely helps to have a few things in mind when making such a big investment of your time and travel budget. PADI (Professional Association of Diving Instructors) – PADI is the world’s leading scuba diving training organization, with more than 6,000 dive shops and resorts worldwide. If you find comfort in numbers, then the agency with nearly one million certifications per year might just be for you! The major benefit to diving with PADI comes at the professional level. For instructors and divemasters, PADI provides far more employment opportunities, and PADI instructors can work independently (while an SSI instructor must teach through an SSI-registered shop). So if you have dreams of staying in Thailand for good to teach the backpacker masses and you want to be loyal to one agency, PADI is your best bet. SSI (Scuba Schools International) – This group has over 2,500 authorized dealers around the world. For divers on Koh Tao, the benefit of doing an SSI certification comes down to best bang for your baht. An SSI course will typically cost you nearly 10% less than a PADI course. If you’re coming to Koh Tao specifically for its status as one of the world’s cheapest places to get certified, those extra baht can make a big difference. The typical diving course is completed in three days. There are videos to watch, book chapters to read, tests to take, and, of course, dives to do! It might sound intimidating, but the course is designed for students as young as 12. The academics shouldn’t intimidate you. Day 1: Classroom work in the morning learning about basics skills, equipment, and the effects of diving on the body. Afternoon is spent in the pool or at shallow dive sites doing skills. Day 2: Morning is spent in classroom finishing knowledge reviews and taking some quizzes. In the afternoon are open water dives 1 and 2. Some skills will be practiced during the dives. Day 3: You’ll go out on a morning boat and complete open water dives 3 and 4. In the afternoon, you’ll take the final exam. Congratulations! You are now an open water diver. After three days of hard work and fun, you’ll receive a certification card that allows you to dive anywhere in the world with a buddy, independent of a professional, to a depth of 18 meters. Many schools will have a videographer come along on dives 3 and 4 and make a 10-20–minute music video–style film of your day. At night, the class will gather to watch it. Depending on how many copies are sold, you can take one home for anywhere from 1,500 to 2,500 baht. If you’d rather be behind the lens, most dive shops rent underwater still cameras for around 1,500 baht. For divers who have already completed their open water course, fun dives cost around 700–1,000 baht each, depending on how many dives you’ll do and if you have your own equipment. Those with time and money constraints will want to make it a priority to visit at least one of Koh Tao’s premier dive sites. These schools are ideal for someone who is confident about going under water (i.e., doesn’t need extra individual attention) and wants to make friends and meet people in a big group setting. These schools have instructors for almost every language imaginable. 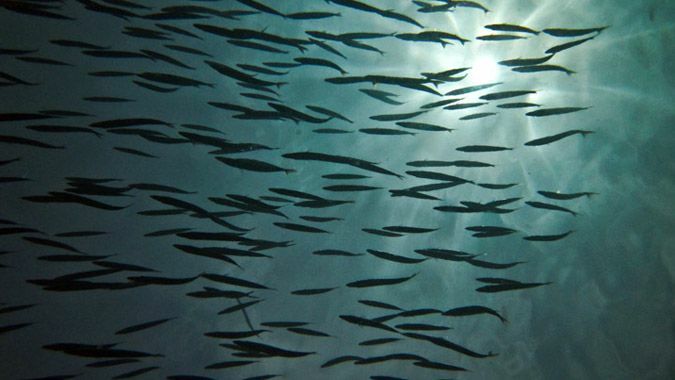 However, groups can be a bit too large for comfort, and Bans in particular does not take open water students to any of the premier dive sites around the island. 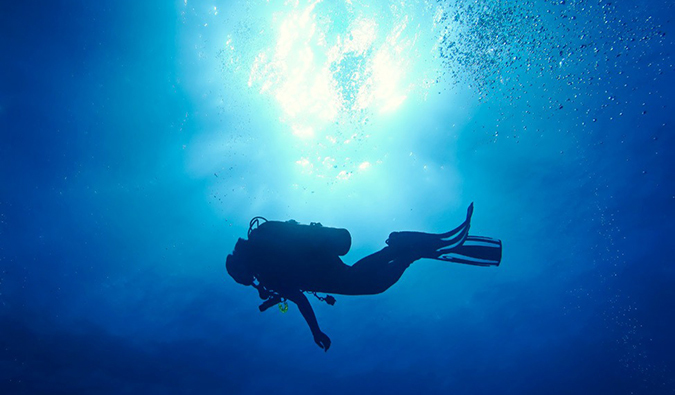 Medium dive schools generally have the best of both worlds. They have a range of instructors and groups large enough to make friends in, but they aren’t as prone to overcrowding or rushing through the course. These schools are great at accommodating special needs and arranging great deals. For example, you might be able to negotiate discounted fun dives post-course. The extra attention with the instructors that small schools and groups allow is key for those who are feeling uncertain about heading underwater or who simply want to be spoiled with attention. When picking a school and an instructor, consider these factors:. Do they have an instructor who speaks your language? How many students will be in the group? What time do they leave in the morning? Those eager beavers who want to be the first on the dive site might not mind being up in time for New Way’s 6am departure, while night owls might prefer Roctopus’s more relaxed dive times. Will my course include a visit to one of Koh Tao’s top dive sites (see list below)? Some of the big schools, unfortunately, don’t send open water divers there. Is the equipment up to date and in my size? Schools in Koh Tao have a good record for equipment range and maintenance, but it never hurts to ask. How qualified is the instructor? Some students may appreciate the enthusiasm and up-to-date training of a new instructor, while others may find comfort in a teacher with tons of qualifications and years of experience. Do you like the instructor? What Are the Can’t-Miss Dive Sites? Chumphon is typically visited for dive 3 of the open water course. 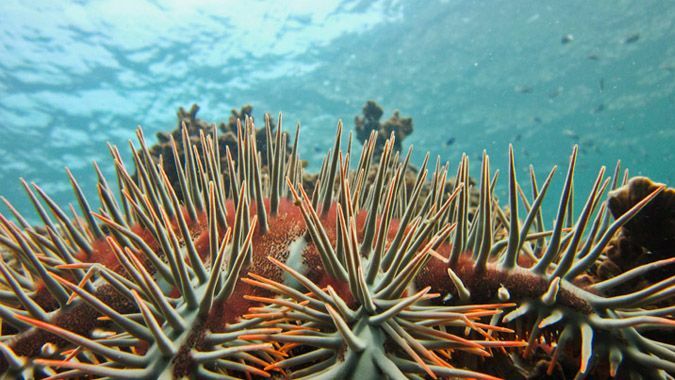 The pinnacles are covered in colorful sea anemone and surrounded by large schools of trevally, batfish, and baraccuda. 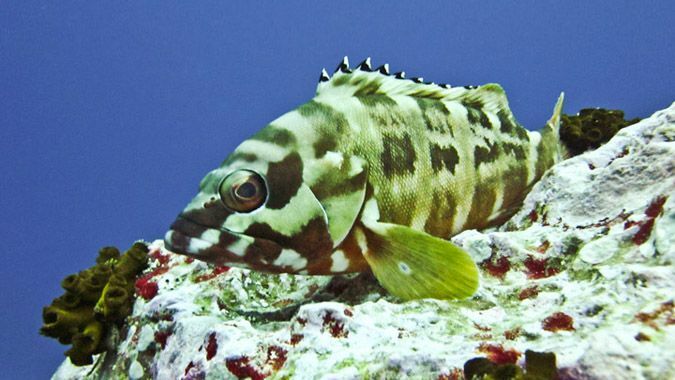 Lucky divers will spot giant barracuda, scorpionfish, and even whale sharks. For those hoping to fun dive, Chumphon is almost always visited on the morning boats. Southwest is an alternative site for dive 3 of the open water course. 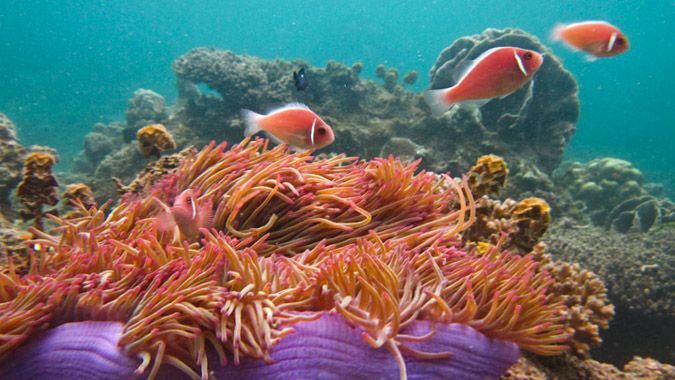 This fun dive site is also carpeted in anemone and the clown fish that accompany them. This is another great site for barracuda and giant groupers. Southwest is almost always visited on the morning boats. 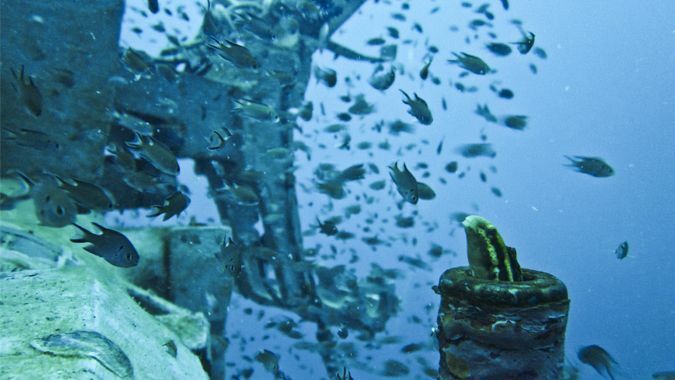 This former US Navy ship was sunk in June, making it Koh Tao’s newest dive site. Sea life like stingrays and a pufferfish have already started to make a home here. Most schools will require you to be an advanced open water diver to dive here or to do it as part of that course. Named for its resemblance to a dorsal fin, this dive site is often less congested than the others listed above due to its location on the western side of Koh Tao. Highlights include a myriad of different corals home to nudibranchs, stingrays, and moray eels. On the downside, Shark Island can have a killer current and very aggressive triggerfish. Sail Rock is an ocean pinnacle located between Koh Tao and Koh Pha Ngan. The dive site takes about two hours to reach from Koh Tao. Occasionally, you can get lucky and complete dives 3 and 4 of your open water here for an extra fee, though generally this is a specialty trip costing anywhere from 2,500 to 3,500 baht. A handful of schools take trips to Sail Rock, but most only go once a week, so if you’re interested, start investigating the day you arrive. This is a common training dive site used for dives 1 or 2 of the open water course. It is just off the coast of Koh Nang Yuan, a tiny island north west of Koh Tao. This site is great for new divers, thanks to its shallow depth and simple layout. One standout is the family of rare saddleback clownfish living in an anemone that divers have clearly marked with a ring of rocks. 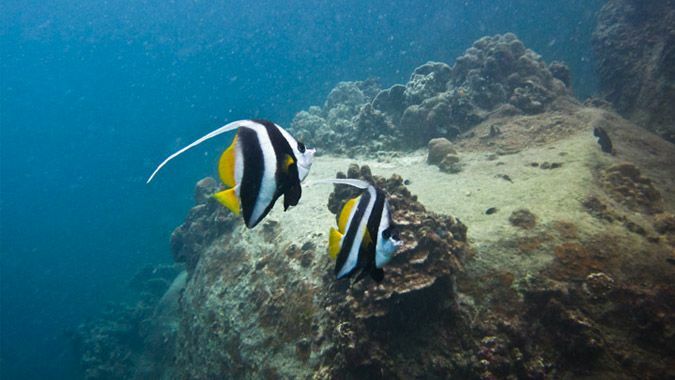 White Rock is one of the most commonly visited dive sites on Koh Tao, frequently for dive 4 of the open water course. It boasts one of the largest areas of any dive site on the island and a range of sea life, from butterflyfish to angelfish to blue-spotted stingrays. Lucky divers may spot a sea turtle passing through. Green Rock is located north of Koh Nang Yuan. The standout feature of this dive site is its many “swim-throughs,” which are caves or cut-throughs that divers can pass through. They are great for practicing buoyancy and finding shy marine life. This is also a popular breeding ground for the aggressive trigger fish, so take care not to lose a chunk of fin! Learning to dive in Koh Tao should be approached with caution, as it can lead to a very serious addiction to the diving hobby and lifestyle! Many a dive virgin has arrived by ferry with plans to stay a few days and get certified, only to find themselves months later calling the island home and working toward becoming a scuba diving instructor. Diving is a lifetime skill that you can take with you around the globe. From the Great Barrier Reef of Australia to the Blue Holes of the Bahamas, from the shipwrecks of Micronesia to the whale sharks of Mexico, diving will allow you to explore more of the world than you ever knew possible. Enjoy it! 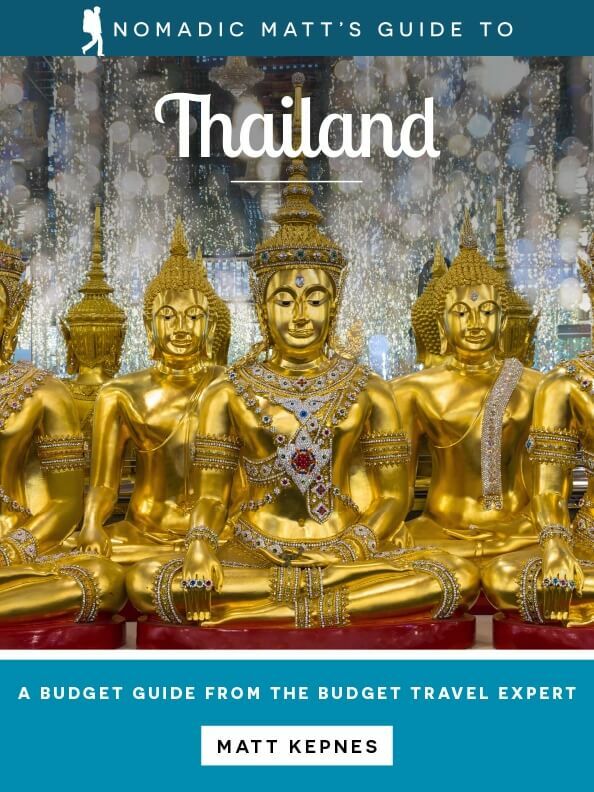 How Much Does a Holiday in Thailand Cost? Alexandra Baackes is an enthusiastic diver and underwater videographer, as well as an on-land writer and designer. 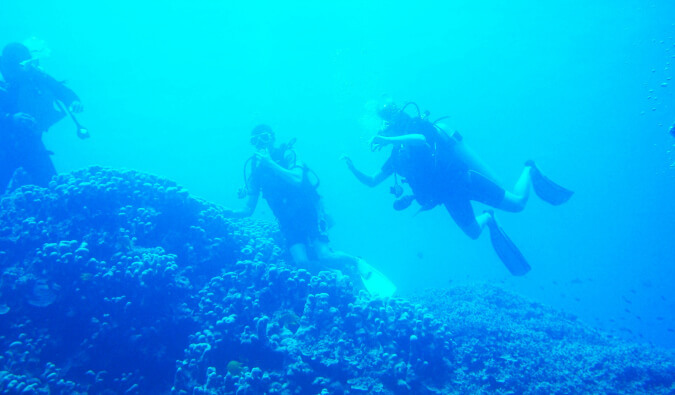 She blogs about travel, diving, and living in Southeast Asia at Alex in Wanderland. You can find her on Twitter talking about fast food cravings and wanderlust at @WanderlandAlex. What a great one stop shop for answer my scuba diving questions! What an awesome post! Diving in Thailand is on my to do list for the trip i’m planning later this year and so this post couldn’t have come at a better time. One question however, is there a right time and a wrong time to go diving, or is it great all year round? Due to Thailand’s two opposite facing coastlines, you can always find a place to dive somewhere in the country! Koh Tao’s official monsoon season is the month of November, though this year it was pretty mild and the sun was shining many days! The seas can be a bit rough though, so if seasickness is a problem, maybe avoid this time of year. I’d also recommend checking out Gili Trawagan, near Bali if you’re interested in diving. I went diving there and saw sharks, sting rays, giant turtles, eels and a shipwreck. A lot of divemasters say Thailand’s visibility gone down slightly in recent years, while other dive spots like Borneo or Gili have improved. I think for diving, Bali might be slightly better. With a bit more than 400 dives under my belt I know scuba diving is a wonderful activity but the “fast food” courses produce many divers who simply can’t dive safely. I recommend taking up diving to everybody and the 3 day course can be OK but please, take it seriously. Learn how to take care of yourself and the environment. I saw too much newly certified divers who wasn’t able to maintain neutral buoyancy and touched the corals regularly. Or there are the beginners with underwater cameras- bad idea. Scuba diving is a really entertaining recreational activity but it will remain so fantastic only if we don’t ruin the coral gardens. Be safe and careful diver! When I first read your blog after you wrote a guest post on Andi’s “My Beautiful Adventures” page, I read about your diving photography. I love your diving posts, especially when you share your remarkable pictures, Alex. Great one-stop guide here, not just for Koh Tao, but relevant information on diving in general. Even though I know several divers who have done open water courses, I learned a lot from this informative and well-organized post. Great photos! No, it’s more expensive. Ko Tao is the cheapest in the world. I learned to dive with Crystal on Koh Tao (one of the big schools), and it was AMAZING. I son’t necessarily agree that the big schools don’t give good individual attention — I felt incredibly well looked-after, especially when I gave myself an underwater asthma attack! My instructor became a friend, and I am extra-amazed at what a good experience I had, given that I used to be TERRIFIED of the thought of diving! I couldn’t agree more. I paid a visit to Koh Tao for my 1st time earlier this year primarily for the diving & wasn’t disappointed. The island has such a relaxed atmosphere & the people really friendly, & the divings great as well & one of the cheapest places in the world I’ve dived. And yes, I was lucky enough to get the whale shark at Chumphon (April). There’s also another dive shop on the island not mentioned that I would thoroughly recommend- Alvaro Divers (Chalok Bay). I discovered these on Trip Advisor & they certainly deserve the excellent reviews they’ve had. Very professional, very friendly & very relaxed. Make sure you check them out. I did my Padi Rescue with them & will be returning next year to do my Padi Divemaster course with them & can’t wait. I can honestly say it’s my favourite destination at this present time. Hi Matt, thanks for the information! Do you know if these schools, have simple dive/s for beginners who don’t want any certification? All the schools on the islands offer beginner courses. Everyone comes here to learn to dive. Hi folks I have just returned from diving on koh tao. I have seen many valid points in the article and the coments I just thought I would add my own, I did my diving at sairee cottage the dive instructor, neil francis, was second to non I discovered part way through the course that he teaches the instructors and it shows. Secondly if you do your open water over 4 days it is quite a lot to take in, I did the advanced course aswell and its a great way to consolidate the knowledge you have been tought also its 2 days of fantastic diving. The only problem I found was that I had to hang up my wet suite and come home to a wet dull uk. My advice is, if you can stay there. 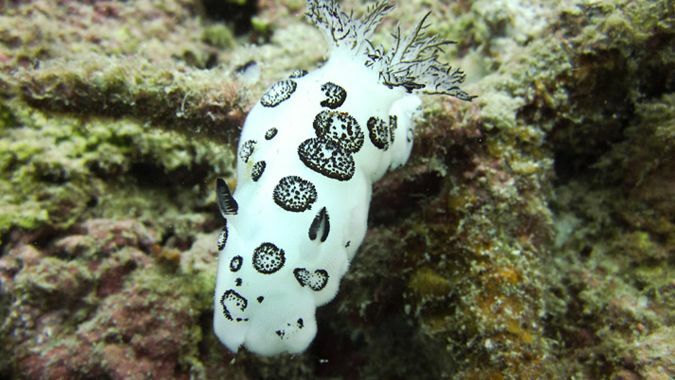 Great post just enough information one required will be in Koh Tao in September and looking forward to a couple of dives at the recommended Dive Sites ….. just wondering which dive School to go through ……. any suggestions ??? Shoot Alex an e-mail. She can give you a list! Hello, I’m going to Thailand Jan 14-28th, 2017. I see these comments are a few years old, but did you go? Any tips on what school to go to? Also, do we need to make advance reservations or just sign up when we arrive? Is the diving as good at the end of December and 3 weeks into January? I just left Koh Tao to move to Chiang Mai last week.. This makes me want to get back to the islands! Do you reccomend learning in Thailand or saving the time and learning in the states beforehand? I don’t want to feel like I am wasting time in class while I”m on vacation. Hi, I live (and instruct) on Koh Tao so I’d be biased to recommend dive schools but in answer to Kyndall’s question, if you have a small bit extra cash (I’m guessing this still works out cheaper than learning at home before you come) and want to enjoy the most time of your holiday while there but still do the course there is an e-Learning option available through most schools which cuts down the classroom time considerably, more time for enjoying the dives and making the most of the island. I have recently spent a week on Koh Tao diving with Simple Life Divers. We saw a 6m baby whale shark on one of the morning dives- amazing experience. Warm, clear water, friendly and professional team, just perfect. Planning a “bucketlist” family vacation with my wife and our three university age kids. Think a scuba course would be an awesome family memory. We have always been beach and snorkling people. Just have never been able to consider scuba… until now. Any recommendations? Have looked at Davy Jones Locker Diving school on Koh Tao. Impressions anyone? 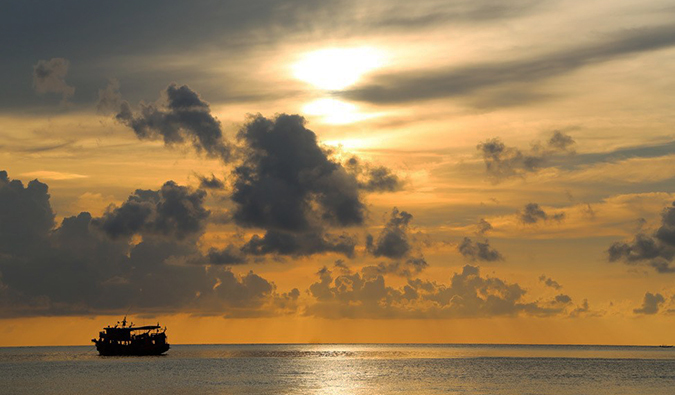 Would like to spend at least one week on Koh Tao. In koh lanta currently and making the trip to koh tao two days from now specifically to get certified. The places that include accommodation with certification do you have to book ahead of time? And if so which ones offer this? I was planning on showing up on the island and negotiating the price once I get there, like I’ve done before, would this be unwise? Andaman sea beach the best sea beach in oll over in world The best time to dive the Andaman Islands is February and March. Our peak season is from November until Mid April. The second week of May brings in the monsoon season. I really would like to see a leopard shark, can any one recommend a place in south east asia? Thanks so much for this! I’m planning on getting my license at Koh Tao in January and had heard about a couple of dive schools, but actually had no clue which one to pick. Many look quite similar on the web 🙂 This article definitely helped me, as I now know what to focus on when selecting one! Thanks a lot! We’re looking for a dive company who offers guided dives to more advanced groups? I don’t mind staying shallow, if that’s where the sites are, but also don’t want to be limited by the least experienced in the group. Hope that makes sense. I loved your post here. Helped me a lot. I went for Simple Life and they were absolutely amazing!!! I would def recommend them to everyone! Great post – I am in Surat Thani now and will head to Koh Tao tomorrow for a Medium sized course. It is great to dive and travel the world, please keep in mind when traveling by Airline you do need to decompress before and after your dives. Plan accordingly and stay within the safe parameters. Ask your Dive shop what they would recommend given that they know better at which depths you would be allowed to dive. Any good Dive Shop should be able to advice the correct decompression time before and after Air Travel. Hi Claude, I’m really glad I saw your post. Is there a particular school you would recommend. I was going to go with bigbluediving but I feel I have been seduced by the Roctopus website/video? Hi, would the 3 day course allow us to dive in Australia independent of a professional as long as we hired the gear? Would you know what the tipping culture is like? Should I give the tips to the instructors only (inclusive of tips for boat captain), or separate tips for instructors and boat captain? And If I’m doing 2 back to back dive courses in the span of 6-7 days, when is the proper time to tip? Should I tip every dive? or before or after the course? And most importantly, how much is acceptable? I don’t want to appear ungrateful and stiff, but I’ve been in many awkward situations where: I gave a tip when it was not considered appropriate, or when I gave too much and the person felt weird, and (worse) too little that I felt mortified. Any help would be much appreciated. Thank you so much! I did my Advanced Open Water with Scuba Junction, one of your recommended medium size operations. they were absolutely fantastic and have the best location on the beach, in my opinion. Highly recommended. By comparison, my husband frighteningly ran out of air underwater at Sail Rock due to faulty equipment and a negligent divemaster who ignored his signals while diving with Good Times. Choose wisely!